Autonomous trains is the most sophisticated technology in the field of railway transport system. Technologically advanced system are used in trains to operate it without the aid of a driver and the safety of the passengers is increased. These trains are furnished with high-powered cameras, latest sensors, GPS data, and onboard computer systems. Autonomous train operation consist of different components which can be automated and based on the automation of components the Grades of Automation (GoA) are decided. The automation of train also consist of passenger safety technology which are included in autonomous train protection. Different terms used in autonomous trains market are: Automatic Train Protection (ATP), Automatic Train Operation (ATO), Automatic Train Control (ATC), Semi-Automatic Train Operation (STO), Driverless Train Automation (DTO), and Unattended Train Operation (UTO). Railways are considered the most efficient and safe means of transportation compared to highways due to fewer number of accidents recorded. Hence the key market drivers of autonomous trains market are increased demand for safety, increased demand for speed and efficiency, and the government support for implanting automation in the trains. Implementation of automation technologies in trains is proved to be more useful for reducing the number of accidents and pollution, reducing the load on the fossil fuels, and increasing the efficiency. However the cost of train automation is very high which could slow the growth of the autonomous trains market coupled with the high possibilities of hacking the system. Continuous research and development in the field of automation technology, increased concentration of manufacturers on developing trains implemented with some grade of automation, and government support have unveiled great opportunities for the autonomous trains market. The Autonomous Trains market has been segmented into three categories: based on grade, based on train type, and region. In terms of grades, the autonomous trains market is segregated as GoA1 + GoA2, GoA3, and GoA4. GoA1 trains consist of ATP with driver and all other components are operated manually. GoA2 trains have ATP and ATO with driver, automatic accelerating and stopping of train, and other functions are controlled manually. In the GoA3 trains train is operated automatically without the aid of driver. In these trains setting train in motion and stopping train are performed automatically, doors are operated by train attendant. In GoA3 trains, stopping the train in case of disruption is done by the train attendant. The GoA4 trains are fully automated and are unattended. In terms of train type the autonomous train market is segmented as long distance train, Suburban trains, tram, Monorail, and subway/metro. Subway/metros has higher rate of automation. Followed by the suburban trains. Monorails were developed in Germany in 1990, and growing in the other regions too. 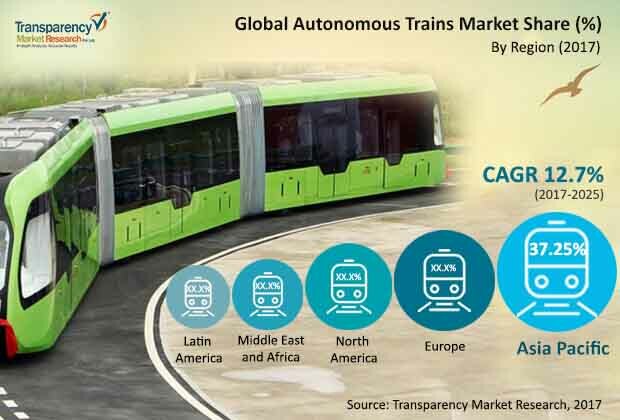 In terms of region, the Autonomous trains market has been classified into North America, Europe, Asia Pacific, Middle East & Africa, and Latin America. Currently the Asia Pacific region is dominating the autonomous trains market. Increased rate of train track laying, awareness about the technologies and government support for the implementation of the autonomous technologies in the train, these factors are leading the Asia Pacific in the market of autonomous trains. Benefits of train transportation, increased emphasis of governing bodies for automation of railways, and future scope for the automation are attracting the global key players for developing technologically advanced trains. For this the key players are concentrated on merger, acquisition, and collaboration amongst them and governing bodies of different countries. Global key players in the market of autonomous trains are Thales Group, Alstom S.A., Hitachi Ltd., Bombardier Transportation, Ansaldo STS, SIEMENS AG, Mitsubishi Electric, and CRRC Corporation limited. This report analyzes and forecasts the market for Autonomous Trains at the global and regional level. The market has been forecast based on figure (Km) and volume (Units) from 2017 to 2025. The study includes drivers and restraints of the global Autonomous Trains market. It also covers the impact of these drivers and restraints on demand for Autonomous Trains during the forecast period. The report also highlights opportunities in the Autonomous Trains market at the global and regional level. The report comprises a detailed value chain analysis, which provides a comprehensive view of the global Autonomous Trains market. The study encompasses market attractiveness analysis, where in end-users are benchmarked based on their market size, growth rate, and general attractiveness. The study provides a decisive view of the global Autonomous Trains market by segmenting it in terms of grade, train type, and region. These segments have been analyzed based on present and future trends. Regional segmentation includes the current and forecast demand for Autonomous Trains in North America, Europe, Asia Pacific, Latin America, and Middle East & Africa. The report also covers demand for individual application segments in all the regions. The report provides the estimated market size of Autonomous Trains for 2015 & 2016 and forecast for the next nine years. The global market size of Autonomous Trains has been provided in terms of kilometers of Track and Unit. Market numbers have been estimated based on Grade, Train Type, and regional segments of Autonomous Trains market. Market size and forecast for each grade and train type have been provided in terms of global and regional/country markets. The study includes profiles of major companies operating in the global Autonomous Trains market. Key players in the Autonomous Trains market include Thales Group, Alstom S.A., Hitachi Ltd., Bombardier Transportation, Ansaldo STS, SIEMENS AG, Mitsubishi Electric, and CRRC Corporation limited. Market players have been profiled in terms of attributes such as company overview, financial overview, business strategies, and recent developments. The market for Autonomous Trains is primarily driven by rising demand for safety in trains. Industrialization has led to urbanization, which has resulted in migration to cities resulted in increased demand for automation in trains.